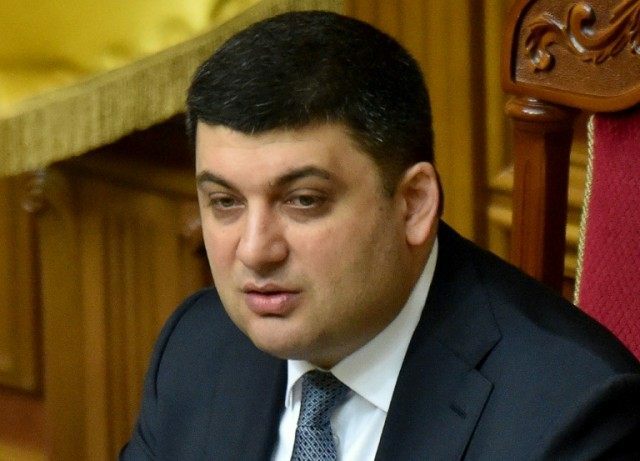 Kiev (AFP) – Ukraine’s bickering parliament resumed horse-trading Wednesday over the makeup of a new pro-EU government headed by the chamber’s speaker Volodymyr Groysman that could be voted on the following day. “We will submit the prime minister’s candidacy to the president and (on Thursday) be able to vote on the approval of both a new premier and government,” Poroshenko party lawmaker Oleksiy Goncharenko told reporters. Ukraine has been gripped by a months-long political crisis that forced Prime Minister Arseniy Yatsenyuk’s to resign Sunday over his seeming failure to fight graft and implement economic restructuring measures prescribed by the IMF under a $17.5-billion (15.4-billion-euro) rescue loan. The release of new tranches of that money and billions of dollars of other foreign aid have been suspended until the former Soviet republic can unite behind a new government and fulfil the pledges made during its historic February 2014 pro-EU revolt. The leaders who succeeded the ousted Moscow-backed president Viktor Yanukovych have seen their approval ratings plunge due to public disillusionment about their ability to break a handful of tycoons’ grip on politics and eliminate corruption. The pro-EU coalition that formed after the so-called Maidan Revolution in 2014 has since cracked and forced the parties led Poroshenko and Yatsenyuk — parliament’s two largest — to win over a handful of other lawmakers to make sure that a new government is approved. Groysman himself was reported to have twice threatened to turn down the premiership on Monday and Tuesday as furious backroom battles raged over who should join his team. He sounded a more cautious note than Goncharenko when speaking to reporters before another marathon day of parliamentary debates. “The situation is very difficult,” the 38-year-old lawyer by training said. “But the time has come for us to assume responsibility. The political mayhem comes against the backdrop of a two-year-old pro-Russian revolt in the separatist east that has claimed nearly 9,200 lives and forced more than 1.5 million from their homes. Russia denies charges by Kiev and its Western allies of orchestrating and supporting the insurgency in reprisal for Ukraine’s turn toward the West.